I have been using a Lumia 920 phone for almost 3 years now, and love it, in spite of a few quirks. I have been anxiously awaiting news of a Windows 10 phone. 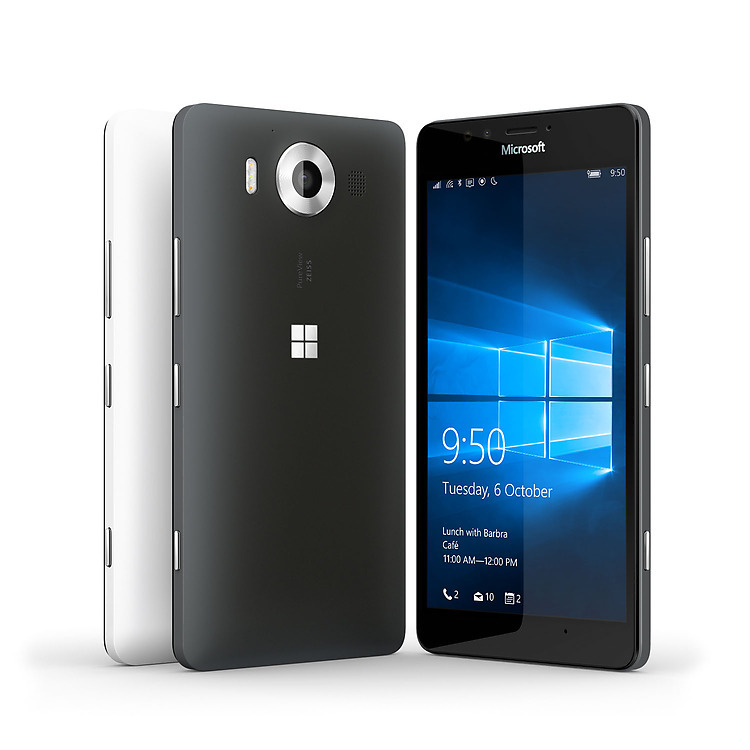 On the heels of releasing Windows 10 operating system back in July, Microsoft did announce the Microsoft Lumia 950/950XL Windows 10 phones. Both phones will come with a 20-megapixel camera. The 950 will have a 5.2” screen size, and the 950XL will be 5.7”. AT&T has already announced that will carry the phone. However, availability of these phones are still up in the air. News is slowly coming out that Microsoft may release a new Windows Phone next year that may be marketed as a Surface Phone, rather than a Lumia. Attachments could include a pen and a mini-attachable keyboard. Read more at the Latin Post. I am not a happy camper with both Bank of America (BOA) and Microsoft. So, what’s their definition of “soon”? You have to go to the Windows Phone App store to find that in “early March 2015” they will stop supporting this app on the Windows Phone platform! I utilize the electronic check deposit feature of their phone l the time. Their suggestion that I do my mobile checking through the browser is a farce, since their web site does not provide the capability of electronic check deposit. Why am I upset with Microsoft? Because it appears that BOA is waling away from the Windows Phone platform, and I’m not hearing anything from Microsoft on this situation. If BOA walks, whose next? And what does that say about the future of the Windows Phone platform? Microsoft announced today (Oct 30, 2014) that the next release of Windows will be called Windows 10. Their main goal is to have a single, common operating system that runs on desktops, laptops, tablets, and smart phones. Windows 10 will be in various stages of internal and beta testing thru 2015, with an anticipated general release date sometime in the second half of 2015. If you want to get a running commentary, with photos, of today’s release, click here. Newer style “apps” will work in more traditional windows, with ability to minimize, move or click X to close as expected. It will not feel like two different worlds which Windows 8 feels like. It will have the ability to have multiple “desktops” with different apps and windows running in each desktop (nice way to separate work and home) and the ability to flip through the desktops. The “charm” bar is still on the right side of the screen like in Windows 8. There will be a “Touch UI” tool to allow operation similar to Windows 8 for those who like that.. and will also be good for two-in-ones (laptop/tablets) to still operate like a touch tablet. They call the new tool “Continuum” that will help users switch between touch and keyboard modes for the two-in-one convertible devices. They’ll be releasing the Technical “Preview” version soon. The Windows Insider program opens tomorrow http://preview.windows.com – there’s a video there now showing a few of the new features. The actual Windows 10 operating system is expected to ship in 2015 “mid to later in the year” as they will still be previewing new consumer aspects and new “universal apps” in April. Windows 10 is also the next version of the phone operating system.. will run the same operating system family on all devices from 4″ to 80″. However phone version does not have a ‘desktop’. I’ve used Roboform on my main desktop for years to store and manage my logins and passwords to web sites. So, when I purchased my Windows 8 Phone (Lumia 920) back in November 2012, I was disappointed (to say the least) when I discovered that Roboform did not have an app for my phone. Lo and behold, after waiting for more than a year, Roboform finally released version 1.0 of their Windows 8 Phone app. I will let you read all the complaints and criticisms from people about this first release. Go to the Windows Store on your phone, and search for Roboform and download the app. Next, login using your Roboform login name and password. The settings page is pretty sparse, and I did not change them from the default. For my first attempt, I decided to see if I could access my Twitter web page, which I hardly do. Type in the Twitter URL, and it then takes me to the mobile version of their login page. Look down at the bottom of the screen, and when I press the left icon (highlighted by the arrow), it displays for me the two Twitter login accounts that I have previously saved in Roboform from my desktop. Windows Phone 8 – Phone Home Please! More than once you’ve misplaced your phone, and it was right under your nose the whole time. With my Windows Phone 8 I can now use the WindowsPhone web site to locate my phone. It displays a map of it’s current location. And it gives me the ability to send out a really annoying beep to help me locate it if it’s close by, or lock or erase it if it has been stolen. Go to the WindowsPhone web site, and login using your Microsoft Live account. Near the top right hand side of the screen, locate your name. Hover over the Windows Phone drop down box, and click on Find My Phone. You will then be displayed a screen with a map of where your phone is currently located, and options top Ring, Lock or Erase. Go ahead and click on the Ring link – ANNOYING, but oh so helpful. Microsoft announced today on their SkyDrive blog site that Live Mesh will be officially retired on February 13, 2013. SkyDrive continues to be enhanced with apps for Windows, Windows Phone, Android, iPhone, iPad and Xbox 360, and is deeply integrated with Windows 8, Windows Phone 8 and Windows RT.